Chocolate? Roses? Why Not Both This V-Day? Roses or chocolate or, credit card be damned, both? Since time immemorial, men have spent February 14th scrambling to buy the right things without paying through the nose. But now there's a way to get both classic gifts in one package, and have some of the proceeds go to a good cause, thanks to Rhonda Kave of Roni-Sue’s Chocolates. 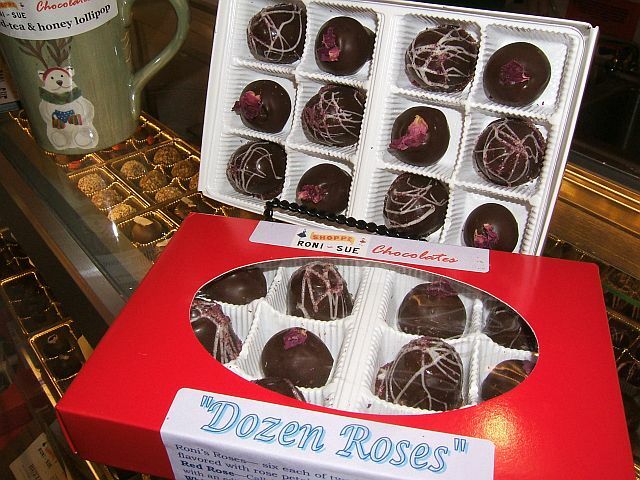 Roni’s Roses are exquisite truffles packed with rose flavor as we found out upon tasting them at Kave’s shop in the Essex Street Market yesterday. They come in red and white varieties. Red is adorned with a tiny bit of dried rose petals and white is criss-crossed with a pattern that echoes its soft white chocolate interior. Both owe their floral punch to a combination of rose petal jam, rose marmalade, and Crispin’s Rose Liqueur, which Kave further infused with dried rose petals. The red variety has a slightly more grown-up flavor largely due to the dark chocolate ganache. Thanks to the addition of rose syrup the white tastes a little bit a rose kulfi ice cream, but it’s not at all cloying. These sophisticated sweets are available as a 2-piece box for $6, a 6-piece box for $15 or a Dozen Roses for $25. Kave will donate $5 from every Dozen Roses to the Coalition Against Domestic Violence to provide phone cards for women in crisis. Before embarking on her present career as a chocolatière last fall, Kave had been the organization’s coordinator of transitional housing. Don’t sweat it if your love’s tastes skew toward combinations of sweet and savory, Kave’s got that covered too. She partnered with fellow Essex tenant Saxelby Cheesemongers to pair three of her truffles with three of their cheeses. Fifty bucks plus shipping gets you three hunks of cheese and six truffles. By far the most bizarrely compelling combo of the three was the slightly fruity sweet Ascutney Mountain from Vermont with blueberry truffle.